With the weather continuing so golden it's hard to avoid spending most time out in the garden. Even tidying the shed seems like a bit of an imposition (although it does need tidying). I have a stupid amount of strawberries in the garden this year as I let them romp out of their pots and they have gone for it. Big time. If it turns into a lot of fruit I might judge it worth it, but at some point I may have to rescue the Bergamot and the Gooseberry which are, kind of, swamped. I was at a fun day on the Saturday -- part of my working Saturdays initiative -- nothing especially unusual about that for me, except that it was on main work time rather than self employed. We're being transitioned into evening and weekend being part of the working life and honestly I wonder if this might not simply be the way of the future. The grid doesn't go down at the weekend. Trains still run and all two hundred and whatever television channels continue to run. It's nice to have a few days a week designated as more leisure likely but if I get an extra one as a result of flexible hours that's probably fine. Work progresses. I'm thinking about an MA. There's an obvious one in youth and community work, another in Local Authority management (?) probably more if I get my serious look on. I have a colleague doing art therapy but to be honest I'm not keen. Not sure why. I'm also re-reading comics, as damiancugley and I are finally (after mumble years) splitting up our comics collection. We just finished the American-size comics and I have been re-reading (in no particular order) Lucifer, Star Man (80s and 90s versions -- and they are both VERY 80s and 90s), Skreemer, a pile of old miniseries (most of which ended up in the blue bin), a smattering of old x-title episodes (I bought with the random desperation of the rurally isolated in my teens) and Ann Nocenti's Daredevil which I remember being a bit meh about at the time but which is engaging, bonkers, beautifully done enough to make me think about questing for all of it. 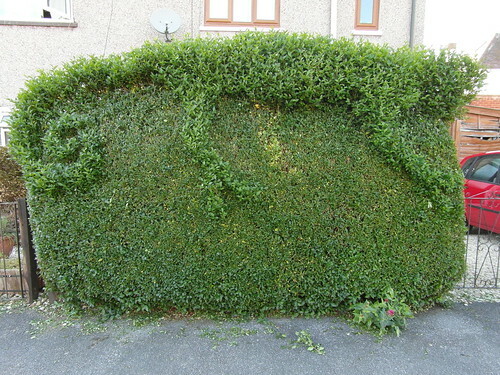 Tim's threatening to get me topiary shears! I did this one with B&Q value shears, though and I like their style.